which ripens in early to midsummer, and the so called everbearing Raspberry. and a fall crop on the current season's growth. is fragile and perishable, which prohibits the shipping of fresh berries. A healthy Raspberry plant will produce good berry crops for 10 years or more before it will need replacement. to verticicillium wilt which is associated with those plants. 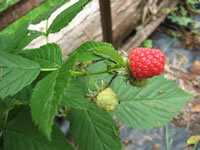 Raspberry plants grow best in northern climates where the spring is a long, slow warming process. They will only survive and produce fruit in warmer climates if the are grown in light shade. Raspberries need full sun for the best berry production. that has been generously supplemented with compost and well rotted manure. Raspberry plants must not be allowed to dry out during their flowering and fruiting seasons. at the rate of 1 pound per every 10 feet of row. Raspberries come in four colors, red, yellow, purple and black. The purple and black varieties have rigid, upright stems and are able to stand alone. Red and yellow varieties are trailing plants that should be supported on wires or a trellis. It is a good idea to add this support before planting your Raspberries. with the bottom wire 30" above ground and a top wire at 4-5 feet. The lateral side branches of the Raspberry plant can then be trained along the wires. 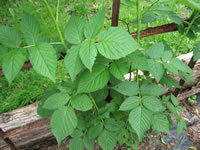 Raspberries can be planted any time from late fall up until early spring before new growth begins. They should be planted 30"-36" apart in rows that are spaced 8 feet apart. Plant nursery grown Raspberry plants in a prepared bed, 2" deeper than they were originally growing. After planting, cut the canes back to 4-6", leaving the stubs to mark the rows until new sprouts appear. Raspberry plants produce their fruit on canes that sprouted during the previous year. Newly planted summer bearing Raspberries should be left alone for the first year to establish themselves. new second year canes will begin to develop around the crown of the plant. Remove all but the strongest 7-10 canes and attach the remaining canes to the top wire. Before new growth begins in the following spring, cut the canes back to 5 feet to induce lateral branching. Everbearing Raspberries require a slightly different method of pruning. They will produce fruit on the top 1/3 of the plant during their first fall. After fruiting, remove the portion of the plant that produced berries, but let the lower 2/3 of the plant remain to produce next spring's crop. Remove the canes completely after they have fruited over their entire length. New canes will quickly emerge to replace the spent ones. they will produce the next years crop. when they reach 2 ft. tall in order to promote lateral growth. Cut the laterals back to 12" during the winter. Raspberry plants can be easily propagated in late summer by tip layering the current season's growth. By late August new canes will begin to arch down in an effort to self-propagate. As the tips of the cane touch the soil, they will often take root and begin to grow upward without assistance. If you prefer to take on the process yourself, simple bury the tips of arching canes about 3" deep. The tips root quickly this way. allow the plantlet to remain undisturbed until early in the next spring, before new growth begins. Raspberries can also be propagated by digging and replanting sucker growths that sprout up away from the parent plant.